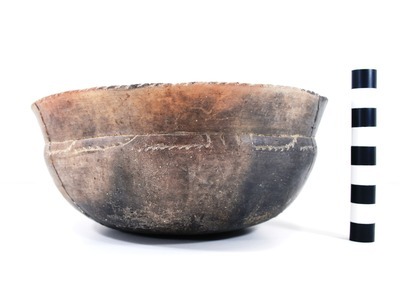 "41HS261, 2003.08.577, Burial 3, Vessel 2" by Timothy K. Perttula and Robert Z. Selden Jr.
DECORATION (INCLUDING MOTIF AND ELEMENTS WHEN APPARENT): The lip is notched, while the rim is plain. The upper part of the body has four sets of three discontinuous engraved scrolls that originate from a single horizontal engraved line, with tick marks pointing towards the vessel base. The sets of scrolls are divided by sets of two vertical engraved lines. Simms Engraved, var. Darco carinated bowl, Burial 3, Vessel No. 2, J. O. and Henry Brown site.